These coils fit JEEP JK WRANGLER COIL SPRINGS. 4 Door JK Wrangler 3" of lift, rear. 2 Door JK Wrangler 4" of lift, rear. 3" Rear Spring Lift for 4 Door Applications. 4" Rear Spring Lift for 2 Door Applications. CANADA WILL BE AN EXTRA FEE. BOXED WARE HOUSE GS11 BL. Skyjacker 2.5" Spacer Kit w/ Shock Ext. Brackets For 2019 Jeep Wrangler JL 4WD. Front and Rear Shock Extension Brackets. Kit Includes:(2) Front Coil Spring Spacers. It's that feeling you get when you rev up that engine. Teraflex has created an exceptional shock absorber designed and developed specifically for Jeep® vehicles. • Velocity valve tuned to react perfectly with TeraFlex Suspensions. JEEP JK WRANGLER SHOCK ABSORBERS. FITS Jeep Wrangler TJ (1997-2006) - Passenger / Right - SB130PA. Planted Seat Bracket-. 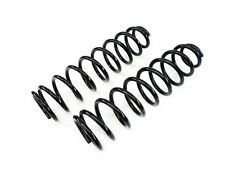 3.5” LIFT REAR COIL SPRINGS - PAIR 1863100. Falcon shocks and TeraFlex coil springs have been designed to work together to improve both compression and rebound for optimal vehicle stability. JEEP WRANGLER JLU 4-DOOR. Teraflex has the solution for leveling your 07 and newer JK. Fits both 2 door and 4 door vehicles as well as Rubicon and Unlimited models. Teraflex 1/2" Front Spacer Set. JEEP JK WRANGLER COIL SPACERS. TeraFlex linear coil springs provide a perfectly engineered approach to lifted springs for the Jeep Wrangler. TeraFlex coil springs are shot peened to reduce spring sag and fatigue, and increase coil spring life. "Moog Coil Springs --. General Warranty Limitations (Applies to all Product Warranties). Product fit : Direct Fit. The warranty is subject to the General Warranty Limitations below. Limited Warranty Coverage Policy. Part Number: 1954100. Warranty Duration:Unspecified Length. 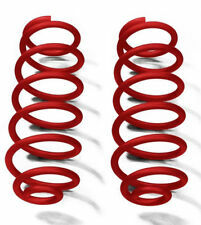 2 DOOR 4" REAR OUTBACK SPRING PAIR 1864202. TeraFlex linear coil springs provide a perfectly engineered approach to lifted springs for the Jeep Wrangler. TeraFlex coil springs are shot peened to reduce spring sag and fatigue, and increase coil spring life. Year: 2016. Model: JEEP WRANGLER. Part: COIL/AIR SPRING. FITS:2007-2018 JEEP WRANGLER. FOR SALE IS : REAR COIL SPRINGS. May be a little dusty from storage use and have few minor scratches. the compatibility we provide is accurate although may not gaurentee 100% fit. FITS:2007-2018 JEEP WRANGLER. FOR SALE IS : REAR COIL SPRING, CAN FIT LEFT OR RIGHT. May be a little dusty from storage use and have few minor scratches. the compatibility we provide is accurate although may not gaurentee 100% fit. These coils fit JEEP JK WRANGLER COIL SPRINGS. 4 Door JK Wrangler 1.5" of lift, front. 2 Door JK Wrangler 2.5" of lift, front. 1.5" Front Spring Lift for 4 Door Applications. 2.5" Front Spring Lift for 2 Door Applications. Manufacturer Part Number: JSPEC3200. 1997-2006 Jeep Wrangler TJ. Position: Front & Rear. Made from quality material for superior durability. Performance part for perfect fit and function. Country of Origin: USA.